The Armed Forces offers many dynamic leadership opportunities for those who want to make a positive impact in our country and abroad. The backgrounds, career paths, and individual motivations of William Koyama, Dora Umeyo Lockwood, Cynthia Izuno Macri, Ann Minami, and Edward Takesuye, all captains in the U.S. Navy, showcase the great variety of naval service. Their successes also demonstrate just how far the Japanese American community has come since World War II, when Japanese Americans were forbidden from serving in the Navy. Capt. Cynthia Macri was born in Minnesota and grew up in Hilo, Hawaii, Cairo (Egypt), Lahore and Islamabad (Pakistan) and Mexico City. She was commissioned as a naval officer and enrolled in medical school at Temple University on the Navy’s Health Professions Scholarship. Macri is a trailblazer, entering general surgery in obstetrics and gynecology and gynecologic oncology when there were few women in this field. 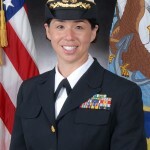 She currently serves as the special assistant for diversity to the Chief of Naval Operations in Washington, D.C., where she directs innovative change in diversity initiatives and inspires high school students to pursue careers in science, technology, engineering and mathematics. Her greatest inspiration comes from her daughter. Through her daughter’s eyes, Macri realized that a parent’s legacy is to be someone your child can be proud of. Capt. 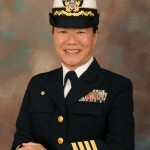 Ann Minami, a Nisei attorney from Seattle, was drawn to the Navy Judge Advocate General’s Corps because of its unique opportunities and out of a sense of service to the country that welcomed her immigrant parents. 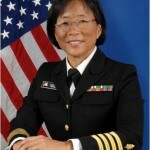 A graduate of Northeastern University School of Law, Minami’s career highlights include two tours at sea on aircraft carriers and a tour in Iraq, where she routinely consulted with the chief justice of Iraq on myriad legal issues, including constitutional challenges during the historic 2010 national elections. She currently serves as the commanding officer of Region Legal Service Office, Northwest in Bremerton, Wash.
Capt. Edward Takesuye, a Sansei from Scottsdale, Ariz., was inspired to join the Navy by his uncle’s service in the Air Force. A graduate of the U.S. Naval Academy, Takesuye served on multiple submarines and operational staffs during his career. He commanded Submarine Squadron Three, managing six submarines, and served on the chief of Naval Operations Strategic Studies Group. 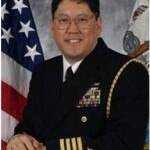 Takesuye currently serves as the chief of staff for the USS George Washington Strike Group, based in Yokosuka, Japan. 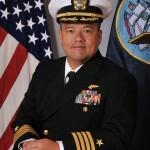 His most memorable experience was when he commanded USS San Juan (SSN 751) as his crew launched Tomahawk missiles from his submarine while supporting Operation Iraqi Freedom. “Throughout my 30 years in the Navy, it has truly been a privilege and honor to stand alongside the many patriot Americans who have chosen to dedicate their lives to the service of our country”, said Takesuye. Sen. Mazie K. Hirono (D-Hawaii), a member of the Senate Committee on Armed Services and the first Asian American woman to serve in the U.S. Senate, remarked, “As the headquarters of the U.S. Pacific Fleet and home to over 30,000 Navy Department personnel, Hawaii understands the importance of a strong Navy. We also know that the power of our forces is not based solely on the superiority of our ships and weapons, but the competence and bravery of the men and women serving our country. Kuroda is a board member of the Japanese American Veterans Association (JAVA) in Washington, D.C.